Music Together Vivo! is proud to teach the Music Together© curriculum, which includes a mix of original songs and traditional tunes from the folk, jazz, and world music traditions in a variety of tonalities and meters. By presenting a range of musical styles from lyrical to blues, from folk to boogie, Music Together provides children with a rich music experience that stimulates and supports their growing music skills and understanding. This gives the children of Northern Virginia a rich music experience, and makes this kids' music enjoyable for adult listening, too! 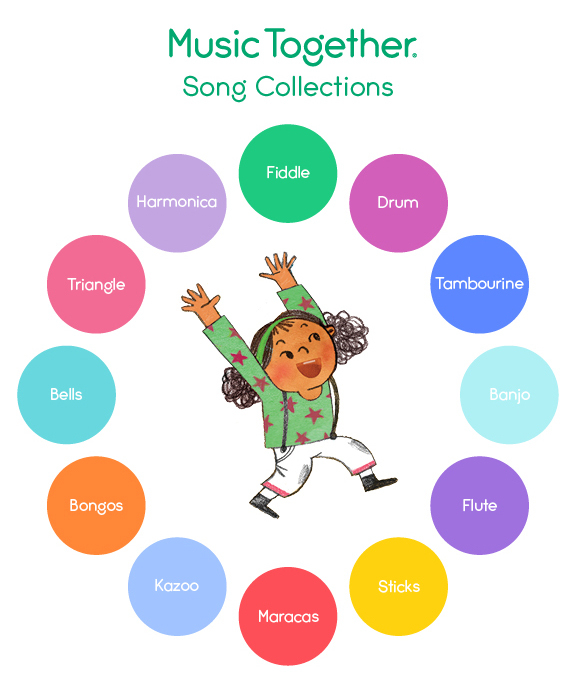 Music Together's nine song collections—each identified by its own color, instrument name, and graphic—are presented in a three-year cycle of three semesters per year. They are non-sequential, so families may join at any semester and attend class for three full years before cycling back to re-experience the collections from their growing children’s ever-changing perspectives. Because music learning is cumulative, with children reaping developmental benefits that build over time, we encourage their participation for as many years as possible from infancy through kindergarten. You may notice that the graphic to the right has 12 collections surrounding the illustrated girl in the center, not 9. Our former Summer 1, Summer 2 and Summer 3 collections have been re-named to "Harmonica," "Banjo," and "Kazoo" respectively. Though they have new names, these collections remain "Best of Music Together" compilation collections. Each semester, families receive one (1) CD along with a colorful and playful songbook illustrated by award-winning artist Jaime Kim. In addition, families new to the program receive a booklet on early childhood music development called "Music and Your Child: A Guide for Parents and Caregivers," written by Music Together founders Ken Guilmartin and Dr. Lili Levinowitz.